The Anchor Inn boasts a variety of rooms options for your needs, including standard rooms with one or two queen size beds, option of additional kitchenette; and hotel suites with 2 queen size beds, living room, and kitchenette. You may check availability, price, and book now with our secure booking page. Please note that we have "No Smoking" and "No Animal and Pet" policies. 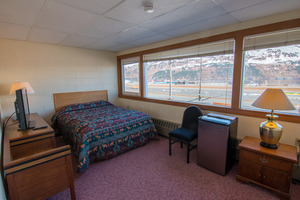 We also offer the option of nightly rentals in a Glacier View Condo Suite. Please contact the Anchor Inn at 1-877-870-8787, 1-907-472-2354, view our secure booking page, or fill out the email form to check for rates and availability, or to make a reservation. One of our staff will be able to help you select a room that meets your needs.